This Ekadashi I made some kadhi using moriyo as I didn’t have any of those fancy farari flours. Usually its made from rajgira flour. I remembered that the ISKCON temple in Mumbai makes kadhi from moriyo and it goes well with moriyo itself or sabudana khichdi or even the farari theplas. Easy to make and something different to have when you are fasting. Wash and soak moriyo or samo in 1 cup of water. Let it soak for half an hour. Put the moriyo along with the water it was soaked in into a pan. Put the pan over medium heat. Add 1 cup of water and a pinch of turmeric powder. Let the moriyo cook till its done. This will take about 10 minutes. Whisk the cooked moriyo with a hand blender. Add remaining water and salt to the yogurt. Whisk it till there are no yogurt lumps. Add the yogurt to the cooked moriyo. Put the pan over medium heat. Add chilli , ginger paste and gur. Stir the mixture constantly to avoid the yogurt from curdling. 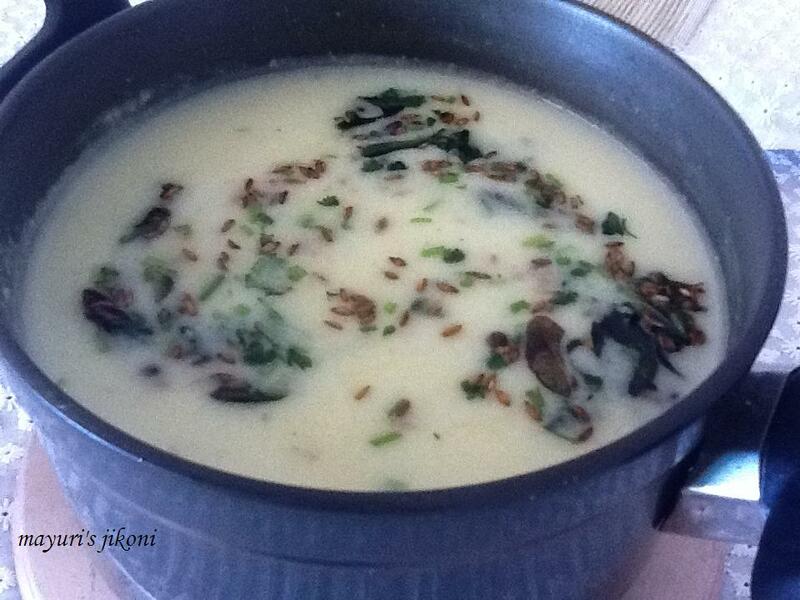 Stir till the kadhi comes to a gentle boil. This will take about 5 minutes. Let it simmer over low heat for 5 to 10 minutes. For tempering, heat the ghee in a small pan. When it is hot add cinnamon, cloves,pepper. When the spices begin to sizzle add the cumin seeds and curry leaves. Stir fry for 30 seconds and pour the ghee mixture over the kadhi. If the kadhi becomes too thick, just add a bit more water. Adjust the amount of chilli and ginger according to your taste. Try and use sour yogurt.